The Roth Language Atelier only offers small group classes or private classes in a friendly, personal and welcoming environment. Language can be trained – the Roth Language Atelier has over 20 highly qualified and passionate teachers who work effectively and closely with the students to achieve their goals. They speak the target language right from the beginning – and it works! Our group classes are very small with a maximum of 6 students for a communicative and personalized approach to language learning. At the end of each level the students must pass an internal test to get to the next level. This way we ensure homogenous group levels. Our training programme is developed according to our students needs. We offer group classes, private lessons, corporate training, classes for children and tutoring. We also prepare our student to the different exams such as Goethe Prüfungen, TELC, Gymiprüfung, BEC, FCE, Advanced, Proficiency, DELF, DALF, etc. Language training is understanding and being understood. Both are important aspects of our language programme. Our courses are target driven and professional. If you are considering doing a language course, visit us to evaluate your written and spoken skills and ensure that the most appropriate class is chosen. As we strive to minimize our negative impact on the environment we use eco-friendly paper and cleaning products, no plastic cups and we do recycle paper, glass, plastic and aluminium. Our language teachers are qualified and experienced in teaching their mother tongue. 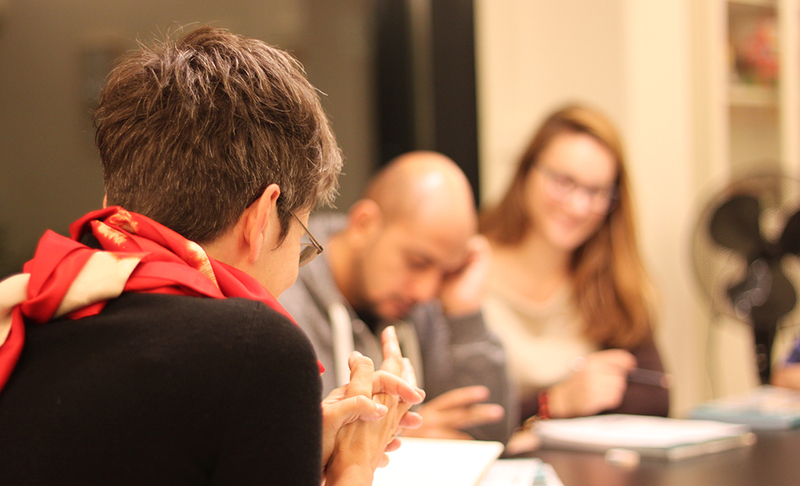 The language school Roth Language Atelier was founded by Helene Roth in Zurich Oerlikon in 2011. As a qualified language teacher it has always been important for her to teach languages in a communicative and personalized approach. Her MA in International Relations and her experience as a director of the French American Chamber of Commerce in Houston complement her capabilitiy to understand the needs of international course participants and companies.